Includes: bra, skirt, arm bands, wrist cuffs, head band, half-circle chiffon veil. Fabric: fuchsia/multi animal print lycra and fuchsia chiffon. Beading: fuschsia and multi, colored stones. 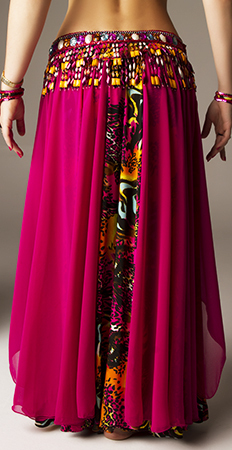 Skirt: full lycra skirt with two slits in front and quater-circle chiffon panels on top. Skirt is attached to the belt. Length 38".